Trust is like a mirror and cannot be fixed once broken. 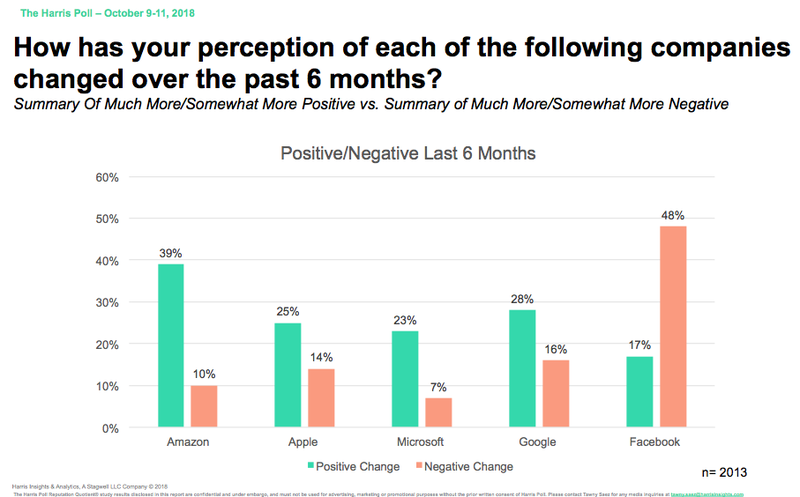 The same saying seems true for Facebook as the most popular social network has been voted the least trustworthy tech company in a poll recently conducted by Fortune and the Harris Poll. Around 2,000 adults participated in this poll in October 2018. According to the poll, Facebook is being trusted by only 22 percent of the US-based users when it comes to the security of their data. In other tech companies, Amazon gains the trust of 49 percent users while Google, Microsoft, and Apple scored 41%, 40%, and 39% respectively. As per the expectations, Facebook is standing at the last place in the poll in terms of leadership, trust, image, and ethics. This downfall of Facebook is possibly the result of recent data breach fiasco because of which the personal data of over 87 million users was compromised during the US Presidential Elections held in 2016. Facebook didn't share its instance on this poll. In addition, another poll was conducted by another company that says Facebook has gained only 17 percent positive votes while 48 percent of the votes were negative. Amazon tops this poll with 39 percent positive votes and 10 negative votes. Apple gained 25 percent positive and 24 percent negative votes. Microsoft is on the third place with 23 percent positive and 7 percent negative votes, followed by Google that has gained 28 percent positive and 16 percent negative votes.